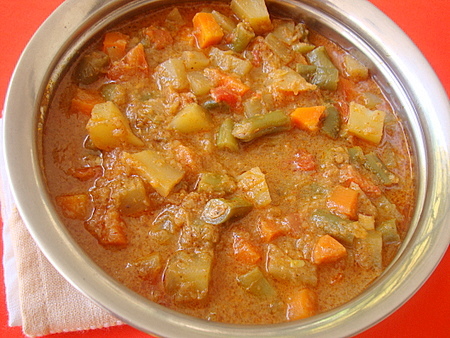 Each time I cook mixed vegetable curry, I tend to tweak and experiment with spices. Today’s recipe is a result of one such experiment. Am quite satisfied with the end result and hence makes an appearance here. 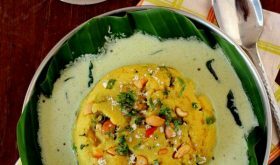 🙂 A versatile dish that makes a decent side with rice, rotis as well as dosas. 1 Heat oil in a heavy bottomed vessel, add cumin seeds and allow to splutter. Add chopped onions and saute till pink. Add ginger garlic paste and saute for 3 mts. 2 Add the carrot, potato, beans and cauliflower and saute on medium flame for 4-5 mts on medium high. Add salt and turmeric pwd and combine. Reduce flame, place lid and cook till the vegetables are half cooked. Add crushed tomatoes and cook further for another 4-5 mts. 3 Add 2 cups of water to the vegetables and bring to a boil. Cook with lid for 7-8 mts. Remove lid, add the ground paste and mix well. Add amchur pwd and kitchen king masala pwd and mix. Cook on low-medium flame for 15-20 mts, till the texture is thick and not watery. 4 Turn off heat and garnish with fresh coriander leaves. 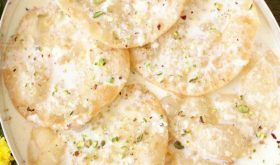 Serve with hot rice, chapatis or dosas. Another yummy receipe from you. 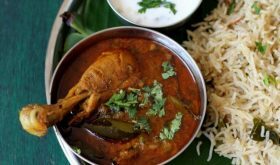 I posted a comment in Dal…saying i want to know the recipe of “KAKINADA KAJALU”…waiting for ur reply. Kitchen King Masala is a versatile spice powder that you can use to season curries and stir fries both vegetarian and non-vegetarian food. You will find it Indian grocery stores. I am yet to try Kakinada Kaja at home. I do not have a proper recipe for it right now. Sailu, I just wanted to make a comment: In addition to your recipes which I love, I appreciate the quotations you place each time above your posts. Today’s was exceptional. Just wondering — do you write this yourself or do you get it from maybe a website or book? Thanks. Thank you, Sarita. 🙂 Those quotations are from my desktop calender ‘Mottos for Success’. This is my favorite one Shailaja Garu, this one is a combination for poori and chapathi. When I make I use little coconut milk and my own spice mix. I am going to try your version this time. I think yours is also good. Hello from Fiji, Sailu! I am a new subscriber, English, married to a part Fijian. We love Indian food. 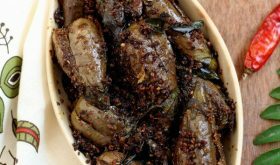 Googling for a new way to cook baigan I came across your site, had a good look, and immediately saved it to favourites and subscribed. Question: Would a little Tamarind substitute for Amchur Powder? I am allergic to mangoes 🙁 Great site, Sailu! Kind thoughts, Sue. your blog is wonderful. tried 3-4 recipes from here so far and all of them turned out mouth-watering. Egg Masala was my family’s favourite. i see that your blog is powered by wordpress.org. just curious to know if you do everything yourself or you hired a designer. would appreciate the info as i’m looking for a good designer myself. The photo is very appetizing and i think i can eat unlimited dosas with such a curry. And kitchen king is my favourite! Lovely recipe.Can’t wait to try it. Is it possible to substitute Kitchen king masala with any other masala powder. Do you think the recipe will turn out decent enough if I omit the kitchen king masala all together. Do try this recipe with Kitchen King Masala. If not available, omit it. I`ve tried the recipe without kitchen king masala. It was fair enough. I feel that adding coconut would add to the taste. Hi sailu , iam jyothi from vizag . iam searching for mixed veg curry in ur blog n tried mixed vegetable kootu for ayyapa swami`s bhojanam (they dont eat onions) it was delicious as u said the flavour was so good every one liked it. Thank you very much. I saw different brands of Kitchen King masala. Which brand do you suggest? Badshah and Everest are good. 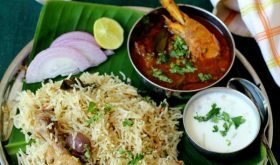 I am a very frequent visitor to your website and have tried a lot of recipes which are all our family favorites now. This recipe is added to that list – just tried it today and it came out superb! I love your step by step instructions… no one can go wrong!! not mentioned in this mixed veg. recipe. Tried it out and it turned out very good. Thanks for the delicious recipe! I tried this one and it came out amazing. Thanks for sharing a delicious recipe! Aren’t the cooking times mentioned in this recipe completely knocking down the vegetables? They are dead and soft as paste by the time curry is ready? your “add the ground paste” at paragraph 3 is confusing. What paste? You already added the ginger-garlic paste at para 1. Pl. clarify. Sorry for the confusion. The ingredients which call for “roasting in 2 tsps oil’ need to be ground to a paste. Thank you. This one came really good and every one was appreciating your knowledge and the hard work you put in for us to make such a delightful dishes.